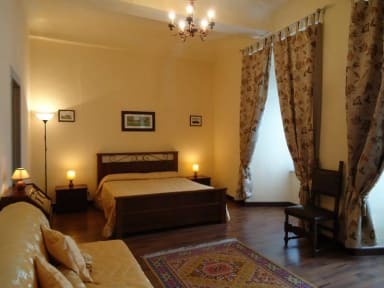 Siena, 이탈리아의 B&B 팔라조 불구아리니 | 호스텔월드에서 예약하세요. 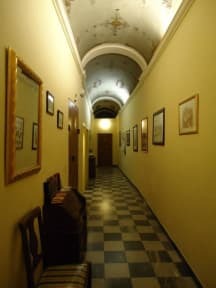 When entering the front door, going up the ancient marble staircase, the owners will welcome you in one of the historic buildings of the city, Palazzo Bulgarini in via Pantaneto already part of Via Francigena, just 150 meters from Piazza del Campo . B&B Palazzo Bulguarini offers accommodations in magnificent rooms, recently renovated and personalized with beautiful frescoes ceilings of the eighteenth century, will immerse guests in the history of the city, making them live a unique experience. The rooms are equipped with all amenities, private bathroom with shower, hairdryer and courtesy kit, digital TV, free WiFi and other amenities to make guests feel completely at home and welcome them as if they were entering their home. The hotel accepts pets. The breakfast is really what everyone dreams to own awakening, with the fragrant apple pie and plum cake with chocolate, freshly baked croissants, yogurts, fruit juices, jams, fruit, cold meats and cheeses, all served in the cozy lounge, where you can see the most beautiful films of Siena and Tuscany. It will soon be possible to enjoy breakfast or enjoy a glass of wine in the enchanted garden. Taxes not included - occupancy tax 2.50 EUR per person per night (from the 1st of March to the 2nd of November). 1.50 EUR per person per night (from the 3rd of November to the 28th of February).